Happy December 1st, 2016 my crafty friends! 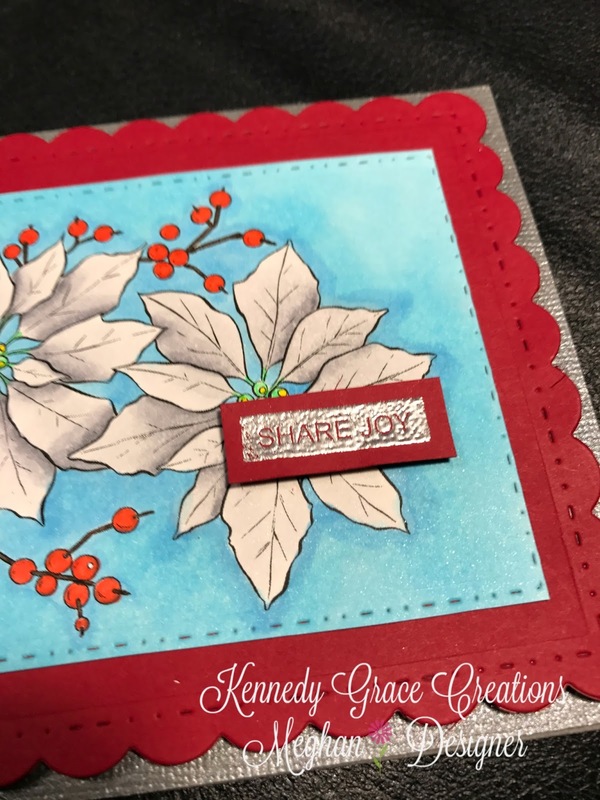 Meg Shea here, to share this lovely sneak peek of Kennedy Grace Creations beautiful poinsettia digital stamp. This card was created using MINIMAL supplies! See below! I laser printed this image on Cryogen white 90lb. - a ultra smooth, subtle, beautiful, sparkle shimmer cardstock (see photo below). NOTE: I get this paper from The Paper Temptress if anyone is interested.... I highly recommend it for a variety of techniques, especially Copic coloring! I started coloring it using only five Copic markers! I used B00 and B02 to color the background. I colored the flowers with N0, N2 and N4. I then added extra subtle, small details with 4 colors of Steadler Triplus fineliners. The fineliner colors used were dark brown, red, light green and yellow. I then die cut the colored panel using the stacked stitched rectangle dies. I cut the largest scalloped stacked stitched rectangle from some Simon Says Stamp Schoolhouse Red cardstock. 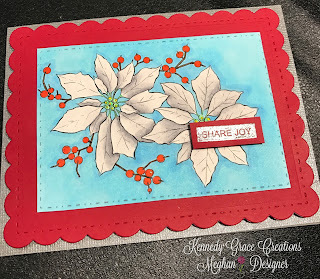 I stamped and heat embossed 'share joy,' using a clear stamp from the Just a Rose stamp set. I heat embossed this sentiment using Hero Arts silver embossing powder. I popped the sentiment up using some black Tombow foam squares. 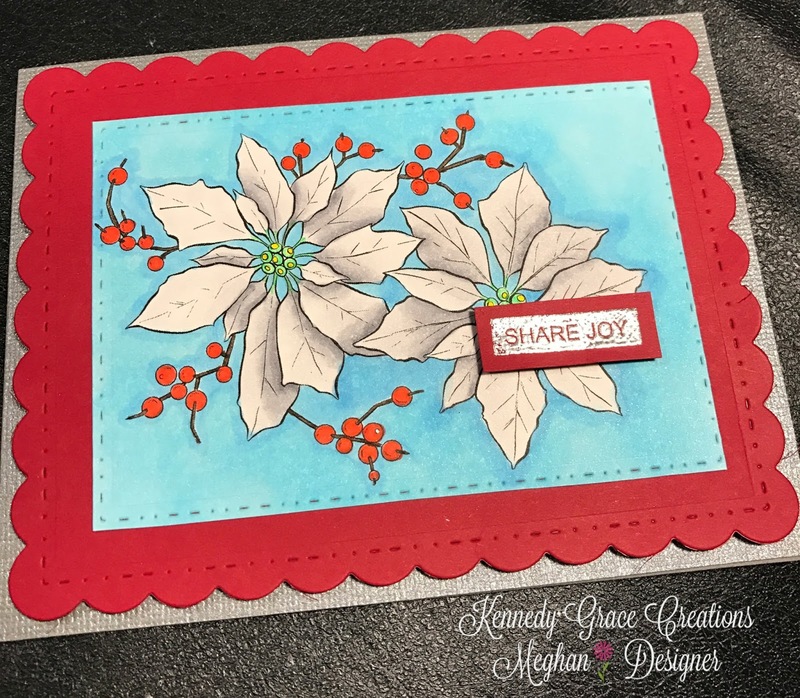 I then adhered the entire panel to card I created using silver Bazzil Bling shimmer cardstock. 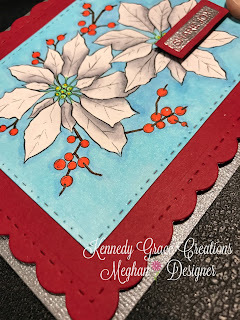 I hope you enjoyed my first holiday card for Kennedy Grace Creations for 2016! Hope everyone has a happy, healthy and safe holiday season!